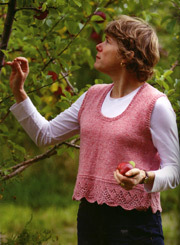 One of the Spinnery’s earliest designs and still a classic favorite, the easy slip stitch pattern turns an otherwise basic cardigan into a project of distinction. Set-in sleeves reduce the possibility of underarm bulk. Great in Mountain Mohair.